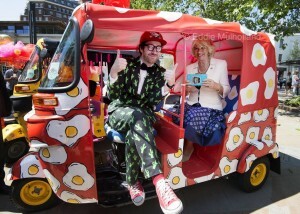 In May 2015 Tuk Tuk UK were proud to supply 15 auto rickshaws to the Elephant Family, who along with the Quintessentially Foundation transformed them into extraordinary pieces of mobile art individually designed by a host of international artists, milliners and fashion houses including Diane von Furstenberg, Manish Arora, Carolina Herrara, Philip Colbert and The Rodnik Band and Nicky Haslam. 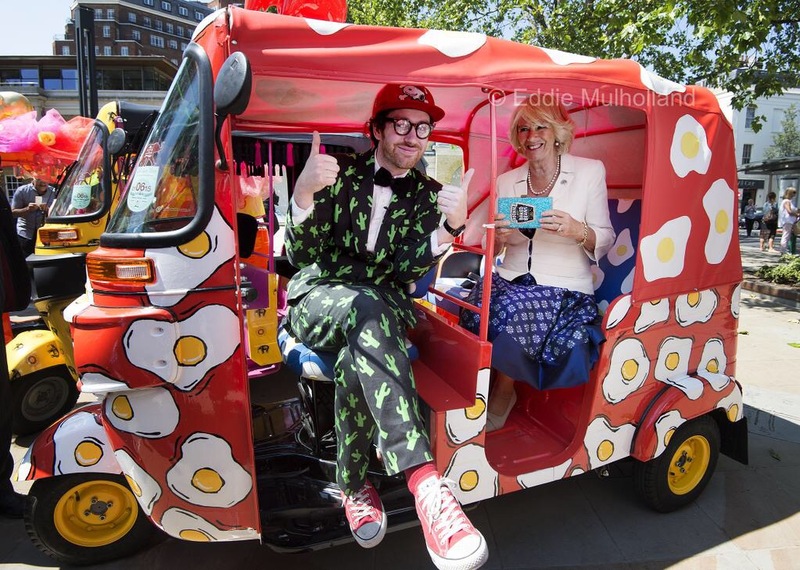 From 1st June 2015, this beautiful collection graced the streets of London, offering everyone a unique chance to join the conservation journey and contribute to the charity campaign by riding the rickshaws in magical tours of the city. Travels to my Elephant is inspired by Elephant Family’s late founder, the passionate conservationist Mark Shand, whose rescue of an Asian elephant, Tara, is recorded in his best-selling book, Travels on my Elephant. The campaign aims to raise a total of £1 million to reconnect Asia’s jungles by securing a series of pioneering elephant corridors. Finally in November a once in a lifetime race will see a fleet of rickshaws journey 500km across India. The event is a rallying call to the world, to save Asia’s last remaining elephants from extinction. After roaming London’s roads on weekly parades; chauffeuring guests to and from top locations including The Goring, Rosewood London and Chiltern Firehouse, transporting willing travellers to Duke of York Square to visit elephants Tara and Ella; and gathering at the weekends in Sloane Square and Covent Garden Piazza to offer the public free rides and a chance to contribute towards the campaign these beautiful rickshaws are to auctioned live by Sotheby’s on 30th June hosted by HRH The Prince of Wales and The Duchess of Cornwall at Lancaster House.